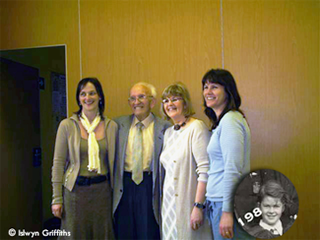 On a visit to Pembroke Dock in 2006 he met with Ann Cole (Parcell) and Joyce Griffiths (Calver) who shared their experiences and memories of that time which had made such an impact on their lives. 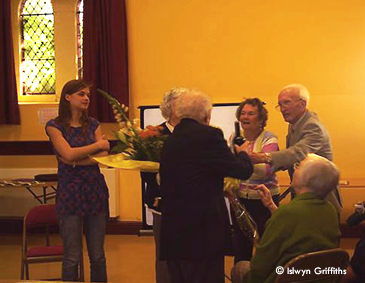 Islwyn not only collected the photographs but also, as its secretary, all the details of the operation of the scheme during its five years of existence. He went through the correspondence etc. and rediscovered it all. 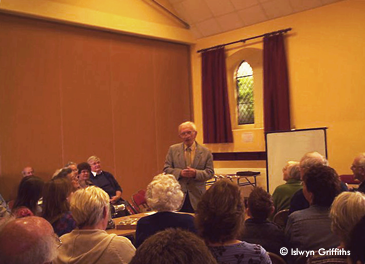 After fifty years Islwyn saw it in a new and different light. He began to understand where its strength lay, why it had lasted five years, and why it had influenced Ann Cole and Joyce Griffiths. 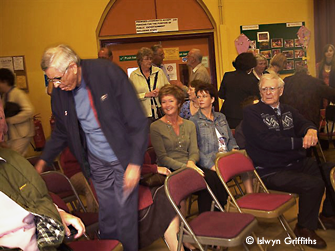 It thrilled Islwyn to realise what they had accomplished and to see that this little slice of a story, which was fifty years old, was, in reality, a great story of a small town’s reaction to a major European tragedy, and it deserved to be remembered. ( DVD copies of the speech can be obtained through this website. 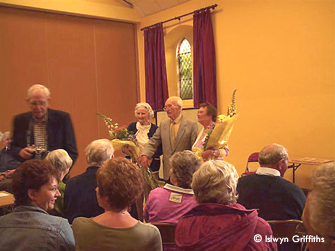 Mrs Evans (mother of Elfryn, Jane etc); Timmy Hay (father of Jacqueline & David, Councillor & owner of the Nutshell shop and press);Islwyn's grand-daughter, Alaw( left) presenting the bouquet.